The Muses' Salon on sale! Catch up on the Muses! Each book in the Muses' Salon series is on sale for 2.99. That's less than a cup of coffee! Enchanting Ophelia is on sale for 99 cents. I've always had pets: dogs, cats, even a brief engagement with fish when I was 11. For a while, so many lost and homeless animals showed up at our house that my husband and I joked that it must have been marked with an animal version of the hobo code: "These people will feed you and find you a home." Here's the youngest of our three dogs, a devilish clever girl who brings me all the dogs' food bowls in exchange for cookies. 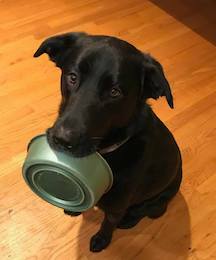 The other two haven't learned this trick, but they still expect a cookie for every bowl she brings. In my books, animals always play some role, however small.